Arthmoor - For his guide on afkmods to fix NavMeshes in an easier and faster way. I decided to make a small guide in which I explain how to fix deleted NavMeshes made by mods. 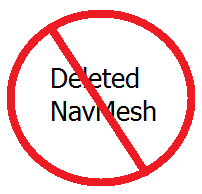 This method is useful for fixing "merged navmesh islands", which cause a deleted navmeshes. Note: Do NOT use any of these methods to clean the deleted navmeshes in the official ESMs, this will do more harm than good. By official ESMs, I mean Skyrim.esm, Update.esm, Dawnguard.esm, HearthFires.esm and Dragonborn.esm.